Congratulations to courtneycem and Alina Conn, giveaway winners! Let's start off the week with an introduction to the stylish jewelry created by artist Julie Dye for her shop Blossom and Shine. 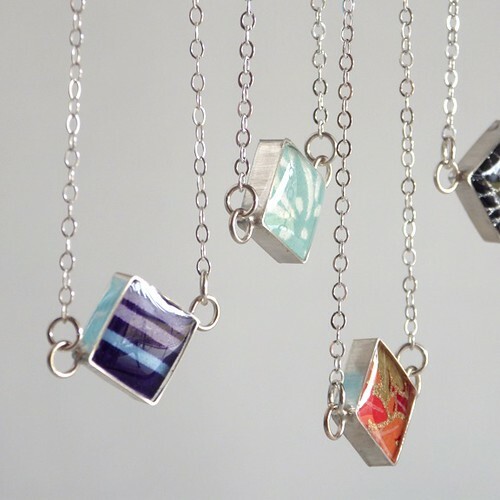 Julie combines sterling silver and resin with paper to make colorful necklaces, bracelets, earrings, rings and brooches. Read on to learn about your chance to win one of her gorgeous diamond-shaped necklaces. Wonderful conversation starters, each one of a kind piece features Japanese paper completely protected by a shiny layer of clear resin, making it durable and waterproof. I love the spotted effect that results from coiling patterned paper. And by folding patterned paper, she achieves another very pretty, but completely different look. Julie lives in Florida where she studied photography at the Ringling College of Art and Design. A day at the beach just might find this talented small business owner modeling one of her unique diamond bead and cord bracelets. The layering of necklaces with different length chains is a popular style... here Julie shows an example of a diamond bead worn with a rolled paper bead and silver triangle necklace. All of her designs have modern appeal based on clean, geometric lines. 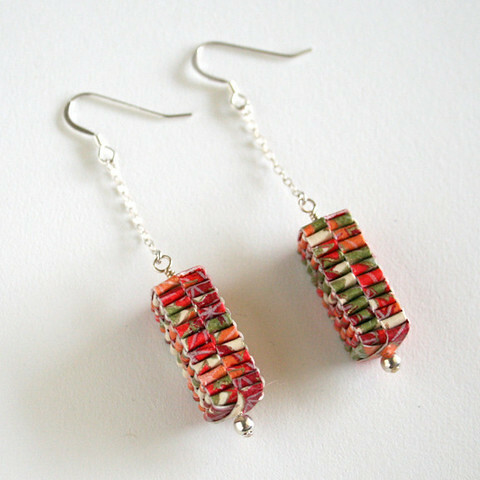 I ordered two pieces of Julie's jewelry to give as gifts and I'm going to be hard-pressed to not keep them for myself! They are even lovelier in person than these photos indicate... the delicate sterling chains and jewelry findings shimmer beautifully and the paper colors are vibrant. Now about the giveaway! Julie has offered to send a diamond necklace of choice to two lucky winners. This offer is limited to U.S. and Canada residents. To enter, just leave a comment on this post through Sunday, May 17. Please be sure to include a way to be contacted within your comment. Earn a bonus entry by following @allthingspaper on Instagram and liking the giveaway photo. Winners will be chosen at random and announced here and on Instagram as soon as they have been contacted. Good luck! 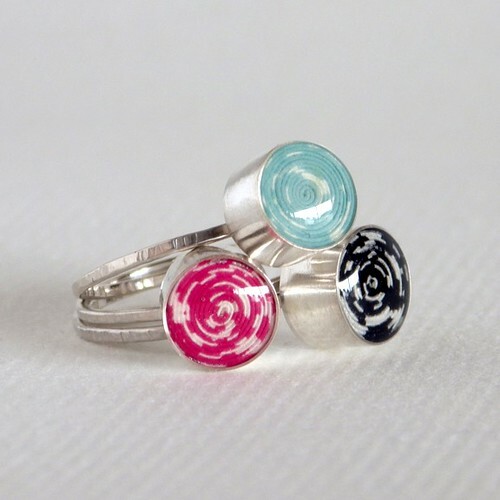 Visit Blossom and Shine and Etsy shop, Blossom and Shine, where you'll find Julie's handmade jewelry along with fashion accessories and gift items, all handcrafted with Japanese papers. Wow - I love when people can do something so straightforward and yet so out of the box! These are stunning - I find it hard to believe that the 'jewels' and 'gems' are really pieces of paper! Absolute alchemy. Please throw my name in your cyber hat ... I love these pieces and I would adore to give one to my mother, who would appreciate it even more. Thanks for the opportunity! Beautiful jewelry. I think the Diamond Necklace is my favorite. I am always drawn to unique jewelry and these pieces are certainly pulling me in! I would have a hard time choosing just one piece. To think that it's "simply" paper! Amazing! She makes beautiful jewelry! Thanks so much for the chance to win! Wow! 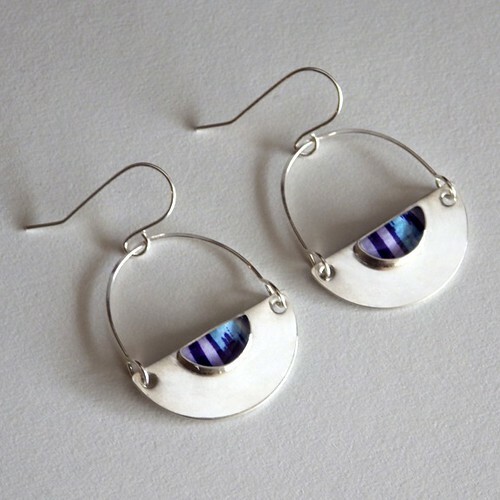 Oh so cool jewelry designs! Thanks for the awesome giveaway! These are beautiful and unique. Would love to win. 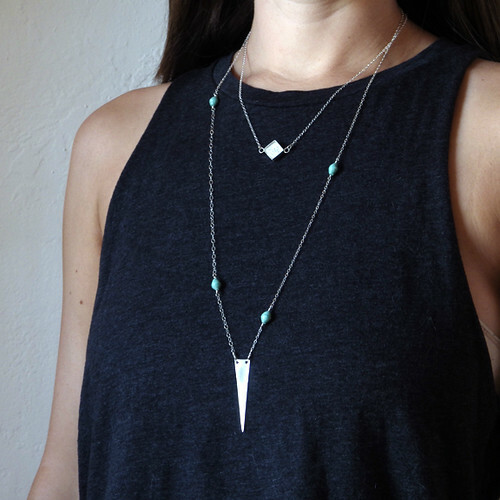 I love the simplicity of these necklaces. They would go with so many things. I just cannot tolerate any jewelry around my neck. It makes me itchy. But my daughter would love it & if I do win, it will have to be mailed to her in USA. Beautiful jewelry with a clean, modern design. Thanks for the chance. I love how the design can be so simple yet have an elegance to it. Absolutely love the diamond necklace and the bracelet. Thanks for the chance to win one. beautiful work.....would love to win one. 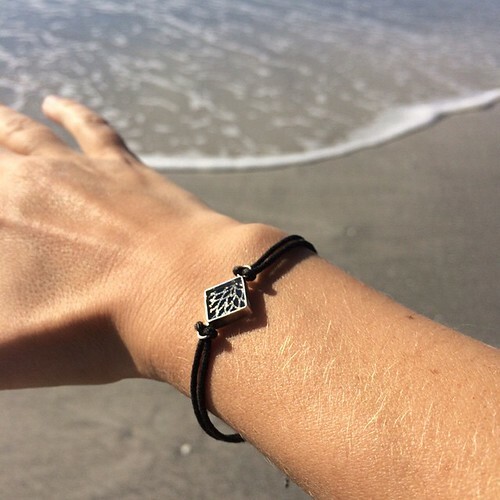 This jewelry is so wonderfully clean and beautiful. I love that it's made of paper and silver, my 2 favorite things to make things from. I love these wonderfully unusual pieces! These are absolutely gorgeous! So different and special. Thanks for a chance to win one. Those are really interesting. Amazing items made with paper. How lovely and unique! Adore the creativity here. Beautiful jewelry. Thanks for sharing this artist. Beautiful pieces and what a wonderful opportunity to win one. Thank you! What I love the most is how simple, yet how beautiful these pieces are! Thanks for letting us see! These are stunning. Thank you for the chance. I don't generally pick gold, although black is much a constant. 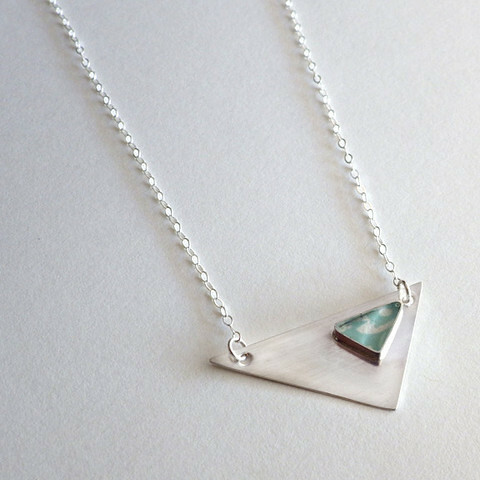 I love https://www.etsy.com/listing/184715252/sterling-silver-triangle-necklace-with?ref=shop_home_active_5. Currently I am loving terracotta so black and gold make a good match. Love her use of Japanese paper! jssychan@yahoo.com wow these are really neat! All so very lovely, I couldn't pick a favorite... Love them all! Great talent! I absolutely love the versatility of this artist! Wow, I haven't seen anything like this before. Just beautiful! Thanks for the chance to win! The paper jewelry is amazing. 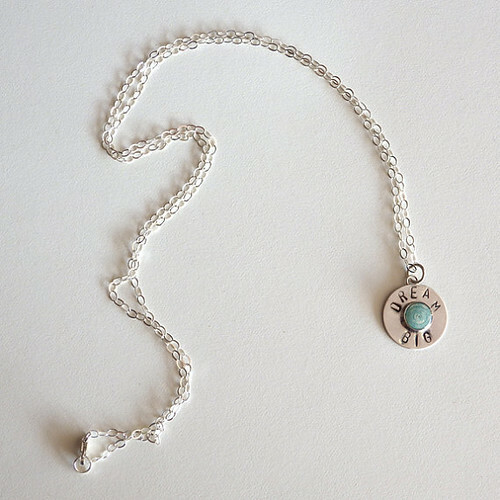 these necklaces are so lovely! thanks for the giveaway! :) my email is in my blogger profile. Love your jewelry, so fresh and colorful. My favorite color is purple. These are beautiful, and so well made! These are beautiful! I know someone who would really love one of these. ellington_emily [at] yahoo [dot] com. Beautiful jewelry. I would LOVE to win one! Absolutely gorgeous jewelry! Very talented indeed. Follow on IG and commented on the photo. These are beautiful I love seeing how people can make beautiful works of art using simple things as paper to make jewelry. These are so unique,love them! 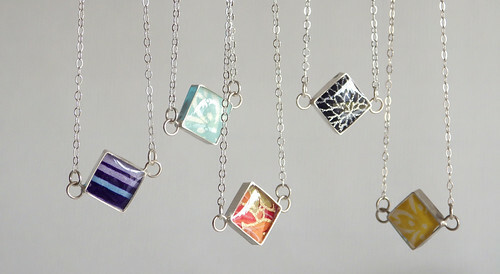 these necklaces are really cool, and colorful...im going to have to think about buying one for my wife for her birthday. I love the bracelet!! The one the model on the beach is wearing!!! It's exactly what I would choose, if I was able to purchase one!! Thanks for the opportunity to enter! Love all the jewellery! So unique and elegant. Love the entire line. It always amazes me how creative some people can be. 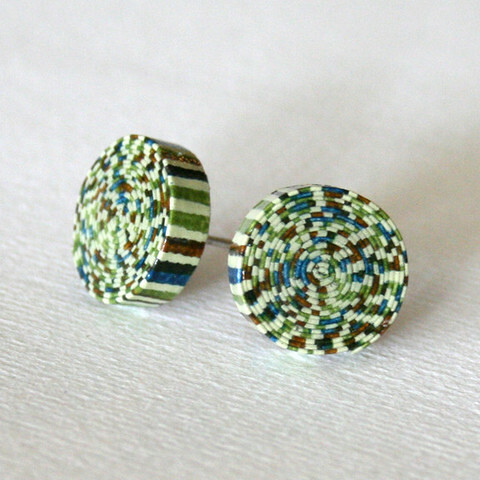 I would have never thought you could make beautiful jewelry with paper! Thank you!! My email is gandastevens@sympatico.ca this jewelry is lovely thanks so much for the chance to win it. Wow! Thse are absolutely gorgeous and my wife would appreciate the beauty! Instagram: elizabethnguyen1 and these necklaces are so cute! Sterling silver and paper--two of my favorite things. These are beautiful! Beautiful pieces and so much talent involved. Love! What beautiful jewelry - I love unique things! I love these pieces. So unique and creative. What a lovely line of jewelry. Beautiful jewelry and so unique. The giveaway has ended. Thanks for all of your entries and enthusiasm for Blossom and Shine's jewelry! All of them are so pretty! !